Sion is a neighbourhood of Mumbai. The Marathi name for Sion is Sheev which means boundary or limit. In the 17th century the village formed the boundary between Mumbai and Salsette Island. The British named it marking the end of the city. The name remained even after Mumbai was joined to the Salsette and extended up to Mulund. However now Sion is not the end of the city. One of the local historical places in Sion is a hilltop garden commonly known as Sion Fort or Sheevon Killa in native language Marathi. 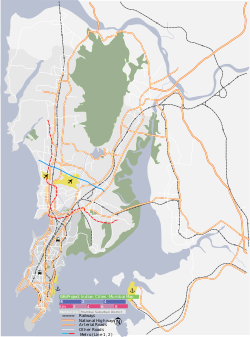 In 1543, the Portuguese took possession of the islands of Bombay by force, naming it Sião. The Portuguese gave the Jesuit priests the sole ownership of some of these islands. The Jesuits then built a chapel on the hill near the present-day railway station and named it after Mount Zion (Sion) in Jerusalem. It's in South Mumbai. Sion shares its name with a railway station on the Mumbai suburban railway on the Central Railway line. Sion also has a bus station. It is in the central line. K. J. Somaiya Medical College & Research Centre. ^ D'Cunha, Jose Gerson (1900). "IV The Portuguese Period". The Origins of Bombay (3 ed.). Bombay: Asian Educational Services. p. 265. ISBN 81-206-0815-1. Retrieved 2009-01-04. ^ Sen, Somit (5 August 2010). "Soon, BEST will start bus services to Vashi". Times of India. Mumbai. Retrieved 28 January 2015. ^ "KJ Somaiya Medical College and Research Centre". Retrieved 2013-01-31. ^ "Sadhana Vidyalaya, Sion, Mumbai". Retrieved 2013-10-27.